Lustre is perhaps the most important contribution of Islamic potters to the development of world ceramics. The lustre itself is a metallic sheen which was developed and used for its glittering effect, imitating precious metal. A pot was glazed and fired by the normal method; the design was then painted onto the cold glaze surface in a mixture of sulphur, silver oxide and copper oxide, plus red or yellow ochre, suspended in vinegar; the pot was fired a second time, on this occasion at a lower temperature and in a reducing kiln – a kiln with an atmosphere containing carbon monoxide, produced by damp fuel or a restricted air supply. The ochre was then gently rubbed away from the surface of the cooled pot, the decorative design remaining fixed to the glaze in the form of a metallic sheen. Such a sheen is imperceptible to the touch and generally speaking permanent, unless the pot is subsequently buried. In this case the salts in the earth may attack the surface of the object and the lustrous effect will disappear, leaving only a yellowish stain. The lustre bowl illustrated has a number of interesting features. First of all the background of dots is a derivative of background punching on precious metal, showing the influence of the latter on the lustre tradition. Secondly, under the early Abbasid dynasty, in the ninth and tenth centuries, Iraq was flooded with Turks, imported from Central Asia to provide the mercenaries on which the Calliphs’ security depended. 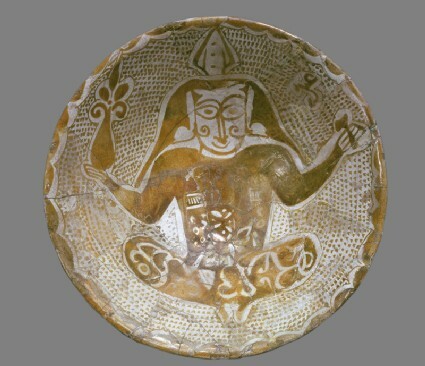 The seated figure on the bowl is nothing to do with Islam. On the contrary he is a Bodhisattva, a Buddhist religious figure, typical of eighth century wall-painting from Central Asia. There such figures often carry a flower in the right hand and a phurbu, a ceremonial dagger, in the left. Here, the flower has become highly stylised and the dagger has lost most of its blade. Likewise the peaked hat is impractical, but probably represents the Central Asia ushnisha. These features show that the artist did not understand the image he was copying. The word ‘amal (made by) in Arabic above the figure’s left shoulder shows that he was a local Arab: his name is probably hidden in the design of the bowl. G. Fehérvári, Two early 'Abbasid lustre bowls, Oriental Art Vol. 9 no. 2 (1963) pp. 79-88.